The CrossFit Games Open workout 15.4 is a 8-minute AMRAP with cleans and handstand push ups. 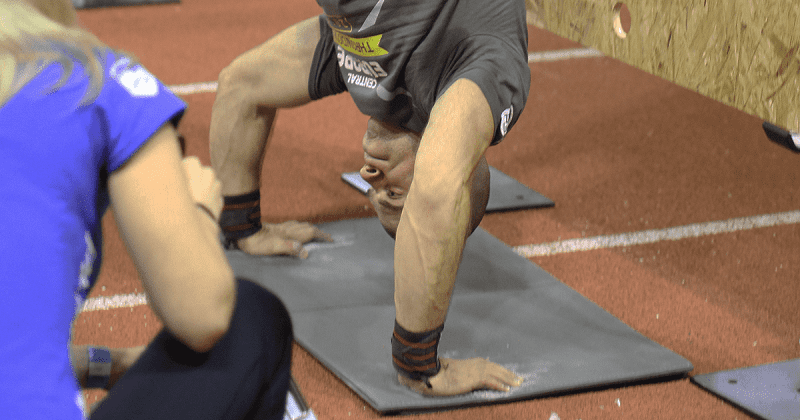 So far we’ve seen handstand push ups being part of the Games and Regionals’ workouts, but have never been used in the CrossFit Open WODs before. 15.4 brought new movement with a new standard. The old one with a limited hands width position is now being replaced with a marked line on the wall determined by the athlete’s height and arm length. Prior to starting 15.4 you have to determine the foot line by standing facing the wall with your hands straight (elbows locked) over your head and your thumbs touching. From there you have to mark the line by measuring down 3 inches (7.62 cm) from your wrists. Each handstand starts and finishes with your heels above the this line. The standard is interesting especially for the taller athletes as this means the width of their hands position will be more adjustable to their body prepositions. To perform a handstand push up, you literally have to be comfortable with being and moving upside down. If you’ve never done a single rep before, choose the scaled version with push presses, but still use the time to practice progression and assistance, strength building exercises. Before attempting any advanced gymnastics movements, the basic ones need to be perfect. Your joint stability and strength should be developed properly to give you enough support for safe execution of handstand push ups. In the following video Carl Paoli, together with Barbell Shrugged, offers tips for handstand progression: before attempting any kind of push ups upside down, you need to have a solid, and also be comfortable in, handstand. Carl Paoli also already presented a detailed video for 15.4 strategy tips: handstand push up progression (for beginners), efficiency tips for advanced level athletes and safety tips to keep you stable and uninjured through the workouts that combine gymnastics movements with Olympic lifts: cleans in 15.4. Colin Geraghty from team Power Monkey shows common faults athlete do with a tripod position. From progressions for beginners to the overview of handstand push up variants in general by Barbell Shrugged. The following quick video is from the CrossFit Games athlete Jason Khalipa offering his views and tips on handstand push ups. Chris Spealler talked about shoulder positioning, keeping the glutes and core tight, and efficiency in general in one of his older videos. Whichever division you’ll choose, RX or Scaled, put safety first. Don’t measure your success by the number on the leaderboard, but by the things you learned from the workout itself. Good luck.